This week the University of Iowa Libraries is pleased to announce the acquisition of the James L. “Rusty” Hevelin Collection of Pulps, Fanzines, and Science Fiction Books. The original press release can be viewed here. Rusty Hevelin passed away on December 27, 2011 after an illness. He was a science fiction fan, pulp collector, huckster (a dealer at conventions), and voracious reader for most of his 89 years. He hitchhiked to his first science fiction convention in Denver in 1941. The convention was called Denvention, and it was the third World Science Fiction Convention (the cons known as World Cons). 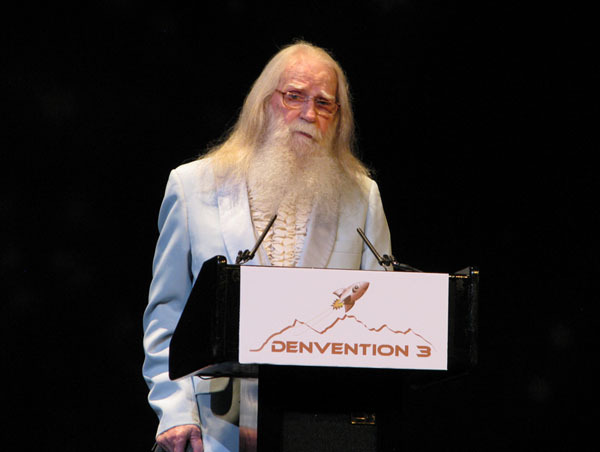 He was the Fan Guest of Honor at Denvention 2 in 1981, and was a presenter at the Hugo Awards ceremony at Denvention 3 in 2008 (photo below from Keith Stokes). To get a sense of what Rusty’s collection is like, it is helpful to get a sense of what Rusty himself was like. Those who knew Rusty were always impressed by his remarkable memory, and his many years as a science fiction fan made him the stereotypical “walking encyclopedia” of fandom. His early years as a fan, convention attendee, and fanzine writer and publisher were spent in the company, and often personal friendship, of great science fiction writers like Robert Heinlein, Ray Bradbury, Isaac Asimov, Frederik Pohl, Lester Del Rey, and many others. He witnessed the evolution of fandom, the adoption of science fiction by mainstream entertainment companies, and many other changes over the course of his lifetime. Rusty’s collection is now here at the University of Iowa, but Rusty’s connections with the state go back much further. He was one of the founders of the state’s two ongoing science fiction conventions, Icon in the Iowa City/Cedar Rapids area, and DemiCon in Des Moines. We will be highlighting many of the interesting items in the collection in the months (and likely years) to come as we begin to unbox and process the collection. Watch this space for future announcements, and also keep an eye on our Facebook and Twitter pages. You will also soon be able to subscribe to our upcoming email newsletter. This is stunning news! I’ve known Rusty since Icon I and had the good fortune to work with him, party with him and discuss life, the universe and everything with him. But I never got to see his archives. Knowing it is just a 30 minute drive from my home exceeds any expectation I ever had of getting to study what he treasured. Thanks to everyone involved in bringing this collection to Iowa. It’s another sign of our balanced look at the past and the future. It is a great addition to the existing fanzine collection. We were lucky enough to have Rusty with us at DemiCon for 21 years. I just makes me happy that his love, his collection of pulp, is with people and a library that will treasure it as much as He did in his long and amazing life. Very glad to see Rusty’s collection in good hands. I’d say stunning but Denny already said that. Very, very good to have Rusty’s collection so close. We’ll be by soonest! I met Rusty when I was a kid, attending SF cons. His collection is remarkable. The UI Library is extremely fortunate to gain his carefully curated collection. I like your summary about Rusty. He was a real asset to fandom and one of my favorite people to see and play “name that book” with. He remembered all kinds of my favorites that I had read from my grandmothers library as a kid and got quite a few of them for me to reread. He was also one of the fairest and most reliable book sellers I’ve ever known. Just a great guy to hang out with all around. Good to see you’re up and running, Greg. Iowa will be a great home for Rusty’s papers and books. Thrilled that we will have this at Iowa! It’s a great addition to an already excellent collection and hope there’s a tie-in panel of some kind at future Icons and Demicons. Rusty was a true gentleman. Glad to see his legacy will live on. Rusty was an amazing person who will be missed by many. It’s wonderful that his collection will be available to those who treasure it as much as he did. Glad to see this part of Rusty’s life in good hands. Rusty was one of the few that made ChamBanaCon EVERY year. Sitting in the consuite and listening to him . . . he will be very missed. I’m another who goes back to ICon 1 with Rusty, Joe, and the SFLIS gang. I am really delighted that his collection is in the good hands of the U of I library.